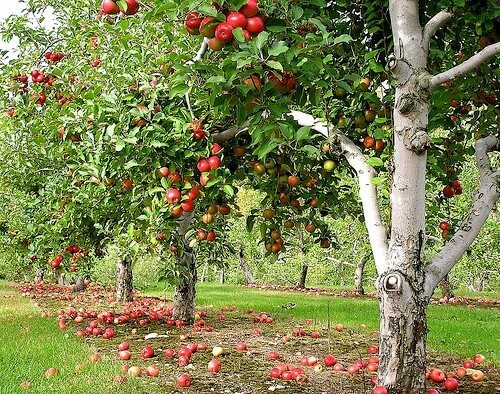 Alford — What to do when your backyard apple trees produce many more apples than you can eat? 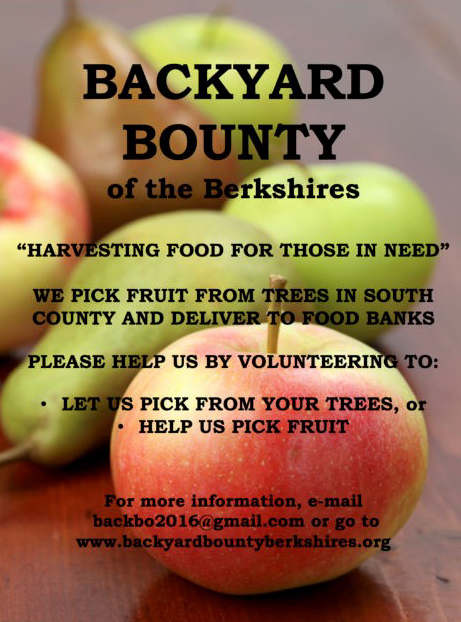 Help is at hand now thanks to the newly formed Backyard Bounty of the Berkshires, a nonprofit established to collect bumper crops of fruit that is distributed to the hungry. Two retired South County men came up with this idea, and now you, too, can be part of this socially conscious mission. A Berkshire apple orchard in the fall, producing an excess of apples that can be given to Backyard Bounty's campaign against hunger. 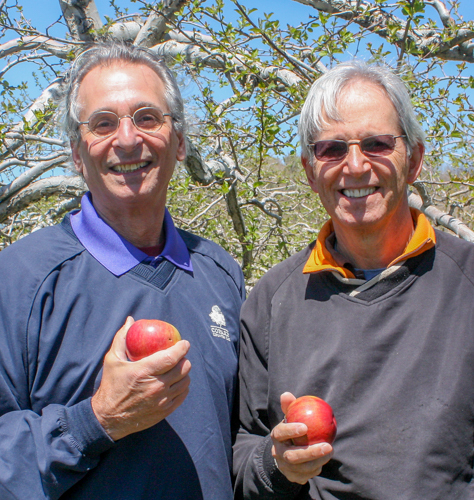 This story started last year, when an Alford resident, Jay Weintraub, was so overwhelmed with a bumper apple crop that he hooked up with a friend, Mark Lefenfeld, to establish Backyard Bounty, a philanthropic organization committed to help feed the hungry. Along the way to this noble goal, the two men are also helping fruit tree owners dispose of their excess fruit for a good cause. Their next step is organizing the gleaning operation. To that end, they are actively soliciting homeowners who usually have an excess crop of apples. Then, when the time is right, they will be looking for volunteer pickers to gather and distribute the apples. There also will be a do-it-yourself option for those who want to pick their own fruit and donate it directly. This elegant solution to two issues — overabundance and hunger — will need homeowners to donate their extra fruit, and then people to harvest the crops. To accomplish their goal, they are working with the Food Bank of Western Massachusetts, and a limited number of other organizations that provide food assistance in South County. Mark Lefenfeld, left, and Jay Weintraub, the organizers of Backyard Bounty of the Berkshires. The biggest challenge to Backyard Bounty is finding outlets for the picked fruit. They consulted with Barbara Zheutlin, director of Berkshire Grown, and Peter Stanton of the Nutrition Center. Stanton suggested that they contact Green Pastures, a fund of the Berkshire Taconic Community Foundation, from which they received a small grant. Finding the fruit tree growers is one challenge. Another is finding local distribution points. To that end the men have been in touch with all of the food distribution organizations in South County, including various churches, WIC, and food pantries. They have enlisted the cooperation of the Food Bank of Western Massachusetts for deliveries further north. To prepare for their first season of fruit distribution they are recruiting fruit tree owners through posters, email, stories, and word of mouth. Zheutlin of Berkshire Grown has been a useful consultant. The men feel that they should publicize their project at the beginning of the growing season to guarantee that they will get enough fruit to make a difference. The two are concentrating their organizing efforts in South County, believing with some justification that there are enough people with fruit trees to collect a sizeable amount of fruit. Moreover, South County is rife with social action organizations that can help publicize their efforts. The Good Samaritan laws provide the men protection from any potential brouhahas that might occur. “We aren’t processing fruit–simply collecting and distributing it,” they say. Weintraub and Lefenfeld have chosen to start Berkshire Bounty with apples because of their durability. Understandably they do not want to start picking fruit only to find that they did not have the right storage to keep the fruit in good shape. Moreover, softer fruit is too likely to get crushed. The pair will be looking for volunteers with pickup trucks, and will rent vehicles if private ones are not available. They will need tools appropriate for fruit picking, cardboard boxes, mesh bags, and insurance. Jay Weintraub, a retired financial analyst on Wall Street, has been busy since his retirement. He created the popular website “Alford Assist,” which gives Alford residents the opportunity to get assistance from neighbors. Weintraub has also been active in the campaign to bring high speed Internet to Alford, and was recently elected to the board of the Alford Municipal Lighting Plant. Mark Lefenfeld was a senior executive at a specialty investment practice for 20 years, and spent the next ten years as a consultant in that field. Following his retirement, he sat on the Great Barrington Finance committee for two terms, and is the immediate past president of the Hevreh congregation in Great Barrington. 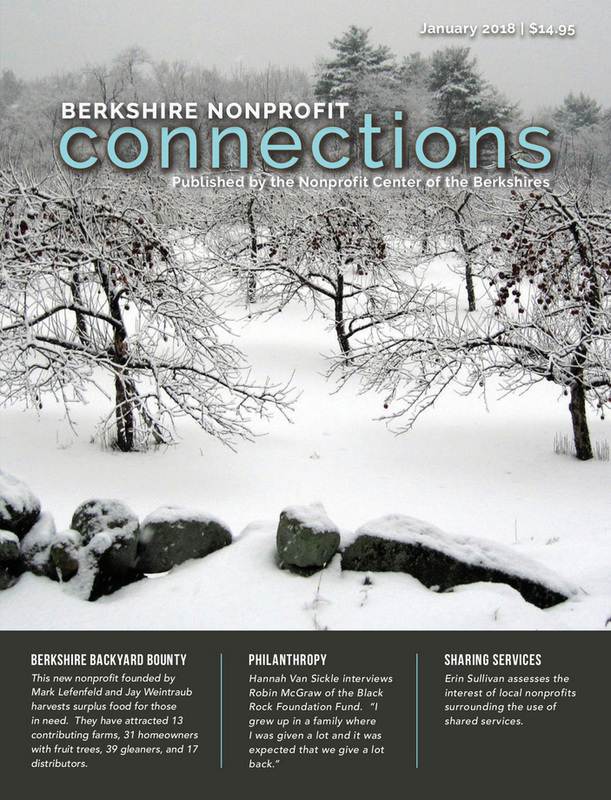 Weintraub and Lefenfeld see their mission in part as raising consciousness about the plight of the disadvantaged in Berkshire County. Berkshire Bounty’s creation is an example of ingenuity and compassion, two characteristics that help define the culture of the Berkshires. “We want to do good and have fun, and make a difference on the hunger issue.” Amen to that.